Three weeks after burglars stole a safe containing $12,000 in donations, the Knights of Columbus has bounced back raising $21,000 from the Annual Raymond A. Loughran Pool Tournament. This weekend is the final weekend in the Knights of Columbus Raymond A. Loughran pool tournmant benefiting cystic fibrosis. The community has really come through for this fundraiser, donating back to the level that was stolen within the first weekend of the tournmant. The Rev. Edward J. Matthews Council Knights of Columbus was honored to have such a great turn out at our annual Cystic Fibrosis fundraiser honoring Raymond A. Loughran. The Knights of Columbus Rev. E. J. Matthews #5989 (2882 Gerritsen Avenue, NY) was was broken into this morning. Stealing THOUSANDS over $12,000 dollars raised for Cystic Fibrosis foundation. They also stole the money from the bar, cameras, computer, raffle tickets. State Senator Martin J. 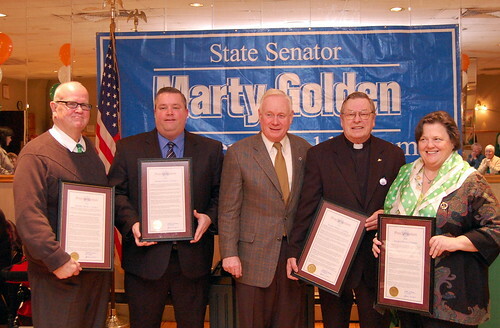 Golden honored local leaders in conjunction with the celebration of Irish Heritage Month on Saturday, March 13, 2010 at the Knights of Columbus on Nostrand Avenue. 1st annual St Patricks Day Parade Gerritsen Beach. The Knights of Columbus Rev. E. J. Matthews #5989 (2882 Gerritsen Ave) is in the middle of getting new siding.